Mercedes driver Nico Rosberg says he expects a "close, tough race" with team-mate Lewis Hamilton for victory in Sunday's Bahrain Grand Prix. Mercedes say the drivers can race freely, barring car problems. Hamilton said: "We just need to be sensible and respectful. The primary target is points for the team but at the end of the day we want to win." Rosberg said: "We're definitely going to try to put on a good show. It's likely to be a good race." The race starts at 1600 BST with Rosberg in pole position, with Hamilton alongside him on the front row, after beating the Englishman in qualifying for the first time this season. 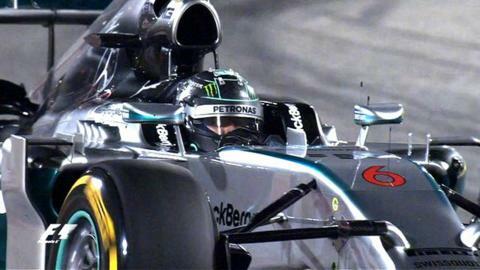 The two have a win each in the two races so far and Rosberg leads Hamilton in the championship by 18 points following the 2008 world champion's retirement from the first race in Australia with an engine problem. Hamilton had the edge over Rosberg in the three practice sessions in Bahrain but the German reversed their positions in qualifying. He took pole by 0.279 seconds. Hamilton said he had been less comfortable with the car after its behaviour changed. "I'm not feeling as great about the race as I was [on Friday] but we'll do some work tonight to try to find out where we can save and utilise the tyres and fuel," Hamilton said. "The long runs were similar but the car felt different today. I need to be smart to work out the changes I can do to optimise pace for the race." Rosberg said: "It's a great battle we have internally and we are both pushing each other all the time, everybody is stepping it up and for the team it's a great thing at the moment and it's always tough against him, of course." Mercedes co-team boss Toto Wolff said: "There is no interference, although of course if we have a technical problem we might inform the drivers. They will be racing each other. This is why we're here. They know how to race each other."